It's been over two years (time flies, eh?) since I first wrote about folk-inspired Leeds outfit To Kill A King. They've done some good stuff since then, signing to Virgin Records/EMI, and selling out this headline gig at London's Cargo. Indeed, this was the first time I'd actually seen the band. And they lived up to expectations suitably. Unfortunately, I missed support acts Lula and Shields - instead sitting in a cinema, watching 'The Perks Of Being A Wallflower'. (It's an excellent coming-of-age drama, by the way.) However, they did make an appearance toward the end of the gig, but more on that later. As To Kill A King launched into recent EP track 'Funeral', there was some immediate handclap action from members of the audience - a rarity in London, I assure you, where we are generally too reserved for that kind of thing. Indeed, this crowd was perhaps a little too enthusiastic - the volume of the chat often overbearing. The band put a heavy emphasis on their latest 'Word Of Mouth' EP, which they've been giving away for free digitally, but is now getting a limited physical release. The new EP has the old To Kill A King at its core but is more ambitious in sound and scope, new guitar and electronica elements introduced - not necessarily a good thing but one that worked well in the live environment. Old favourites appeared too, including 'Bloody Shirt' which incited whooping from the crowd and 'We Used To Protest/Gamble' which forced the crowd to hush after a Fleet Foxes-esque acapella opening. The band also tapped into their Ralph's Balcony series of live session tracks, inviting Fabienne Débarre of We Were Evergreen and Dan Smith of BASTILLE (as well as both supports) to join an inspiring rendition of 'Choices'. Surprisingly, this wasn't the end of the evening as To Kill A King ended triumphantly on 'Fictional State'. Alas, that wasn't the end either. The band succumbed to the faux-encore and the two songs that followed seeming sadly tepid, in comparison to the initial conclusion. Although I'm sure I was one of the few to feel that way. Regardless, this was a fine evening. 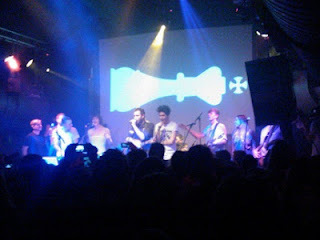 Find more info on To Kill A King at tokillaking.co.uk. 'Word Of Mouth' is on ltd physical release, purchase at tokillaking.bigcartel.com.